Longtime Mac users are accustomed to moving files around in Mac OS X by dragging and dropping them between folders and directories, or perhaps using the more Windows-like file cut and paste ability. Both of those methods work just fine to relocate files and move things about, but another lesser known option to move a file can be done when that file is currently open, just by using the files window titlebar. This is a fairly hidden feature in Mac OS X, so if you’ve never seen file relocation done entirely through the documents active window titlebar before, don’t be too surprised. Hidden or not though, you’ll find it useful and a cinch to use. You’ll need Mac OS X 10.8 or 10.9 or newer to have this feature, so be sure the Mac has a modern version of Mac OS X, then launch a file within an app before trying this out yourself. This is an incredibly useful feature for those of us who use “All My Files” to manage files and don’t necessarily pay attention to where every single thing is stored, and it’s also extremely handy for when you’ve used Spotlight to open a file directly from wherever it was stored. 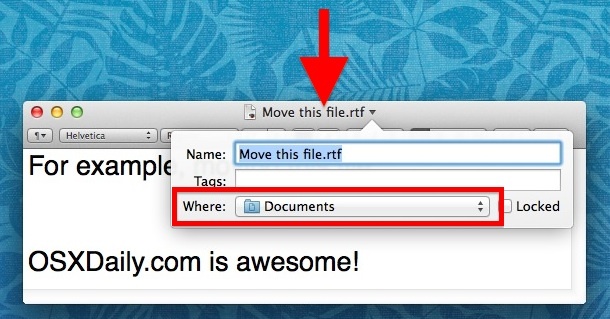 While the example here used a document that is opened within TextEdit, moving a file from the “Documents” folder to the “Desktop”, you can move a file from anywhere to just about anywhere in Mac OS X. The same menu can even let you move a file to iCloud so that it’s accessible from other Mac OS X and iOS devices using the same Apple ID, offering this as an alternative option to more traditional file sharing. The titlebar moving feature is only available in newer versions of Mac OS X, but is largely supported throughout most new Mac apps. Similarly, you can also rename a file in Mac OS X through the titlebar too by using the same dropdown menu. Apps that support one of these features always support the other as well. This doesn’t work with Word for Mac 2011 documents. Nor with Excel and Powerpoint. Wait until Microsoft Office 2014 or 2015, it always takes a while for Microsoft to update their software to 2-5 year old technology. It doesn’t work in older apps that have not been updated to support the new features in OS X Mavericks. Same goes for iCloud and saving to iCloud, etc. Microsoft Word is from 2010 (versioned as 2011), so it’s a 4 year old version built when OS X Snow Leopard was the hot stuff, therefore it’s lacking all the features that would make it useful to modern Mac OS X versions. Of course it’s not just Microsoft Office (a new version is reported this year though! Office 2014 or 2015 for Macs!! ), many other older apps don’t have the feature either. If you want the newest features, use the newest apps whenever possible. 1. if you click and hold down the icon in the window title bar of any open doc (you do have to hold down on the icon for a second for this to work), you can drag it off and it creates an alias that can be dragged to any location. 2. if you hold down the option key while clicking on that icon, you can drag a duplicate to any location. I presume the fault lies with LibreOffice. I’ve tried this on Bean files, PDF’s and on OS X clipping files — it doesn’t work anything like you say. The contextual menu opens up, but it doesn’t look anything like your example, nor does it allow you to rename the file or save it to another location. I’m running 10.9.2 and FinderPop 2.5.1. Another FinderPop user…tip a pint to Turley! If a contextual menu appears you are right clicking or two finger taping on trackpad. Single click on the file name text. Fantastic feature, don’t know how I managed without it all these years. In previous versions of OSX, it works using the proxy icon – not sure whether that’s changed in Mavericks. It works perfectly – nice to be able to name a document and file it at the get-go. Doesn’t work with LibreOffice files either…. Unfiortunately ‘other’ lets you not drill down to a target folder. 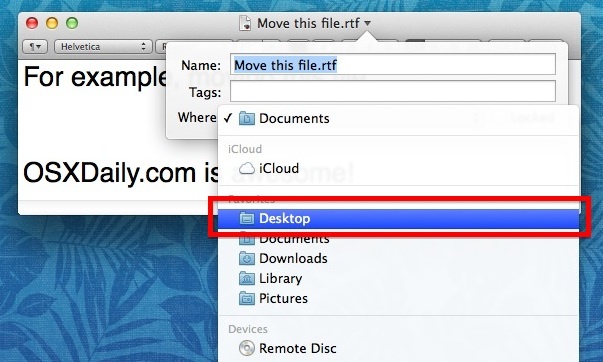 If you need to move the file to other’, it is faster to move the file to the desktop and then to an open window. Doesn’t work anywhere. running everything up to date. Is it also possible to completely get rid of this feature?